Wednesday at Petra School is Art and Composer Day! But. . . . This week it was also massive wind storm no power day! All of our local schools were closed for the event, so we had a friend over. 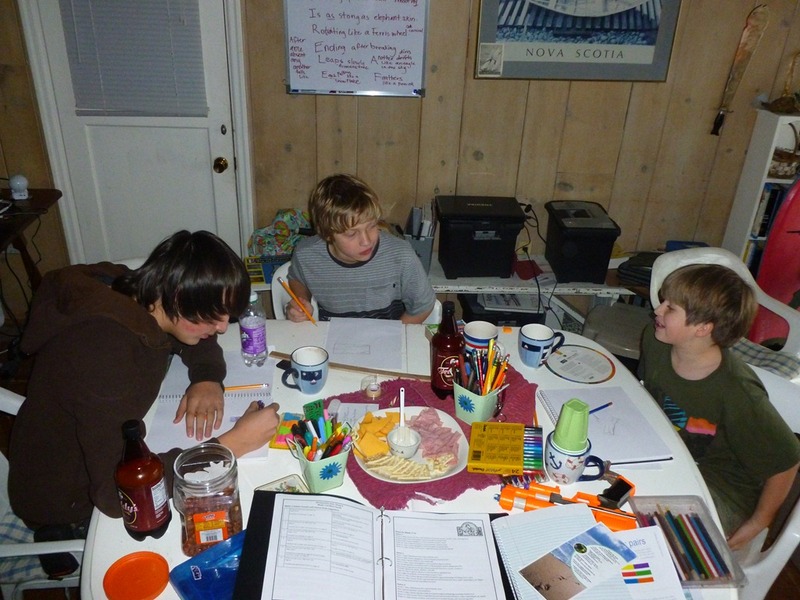 I love it that both boys still wanted to do our art study – and insisted that their friend join in. Yea for paying the few extra dollars to have a Printed Copy of the Harmony Fine Arts Plan! 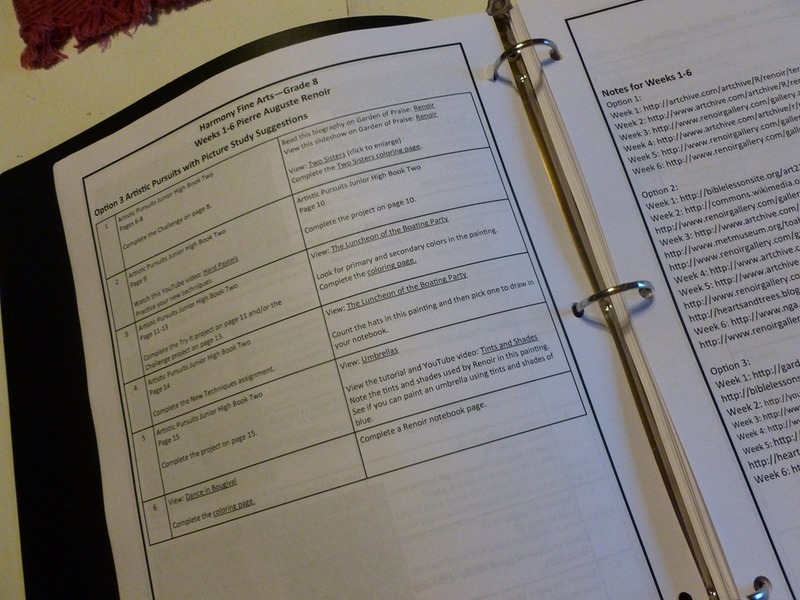 Since we are in week three of the study – (Renoir and Tchaikovsky – Option 3) it wouldn’t have mattered too much – but it is nice to have a guide. We are further along in the Artistic Pursuits book, since we used it for a review last term, so we are picking up Unit 4 this week, Complementary Colors. 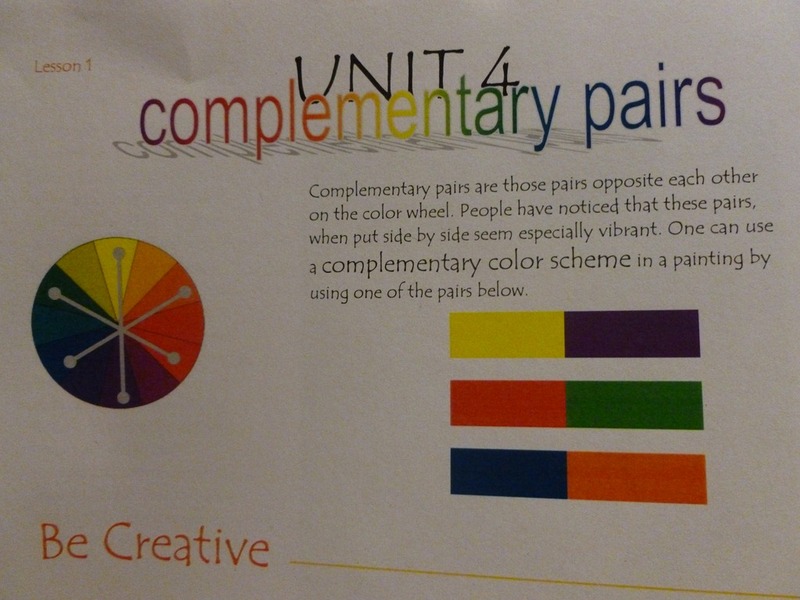 We talked about Complementary Pairs using the information from the Artistic Pursuits book. It went well with the photos pictures we are observing in Modern Art, the boys quickly saw examples. I have an older Stampin Up Color wheel and pulled it out to show the differences between Coordinating Colors and Complementary Colors. Often, when scrapping a 6×6 page, I choose one color from a piece of clothing, item in the scene, and use the Complementary Color. It’s sort of weird, you don’t expect the boldness to be there, – but it really makes the layout look great. Jon is working for a company in town, creating an ad campaign with digital design, and he immediately saw the bold colors. We talked about the fact that you can have all the best information and layout possible, great fonts, elements, etc – but if your colors are random, it makes the eye turn away too quickly. A challenge in the text led us to look around the home for Complementary Pairs – and then draw them in pastels. This was pretty tough, most of our house is Red, White and Blue. Nate found a Crush bottle in the recycle, (Purple/Yellow), our friend found a Match Box (Green/Red), Jon found a hummingbird magnet (Blue/Green – Red), I found a stack of water cups that was placed in a coffee cup (Red / Green). 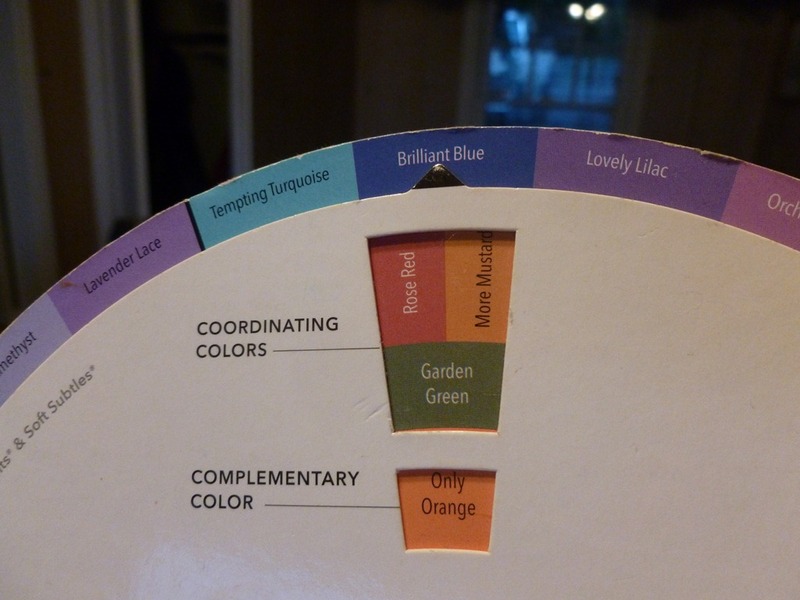 In the end, the simple color wheel in the book was easiest to use for Complementary Colors. I think I will pick up a simple color wheel from the craft isle for Jon to use in his digital design. Not the best photo – we ended up using colored pencils, markers and pens – so the colors do not photograph well. The boys were able to have a conversation about how much bolder and easier to lay on color it is with pastels. 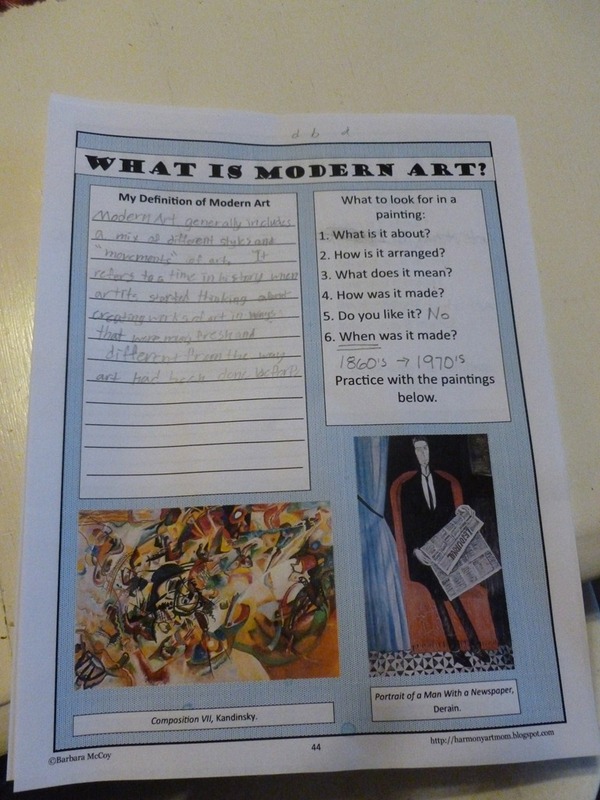 We were able to use our library books – one assignment that we’ve been working on – answering “What is Modern Art?” Nathan completed his Notebooking Page. 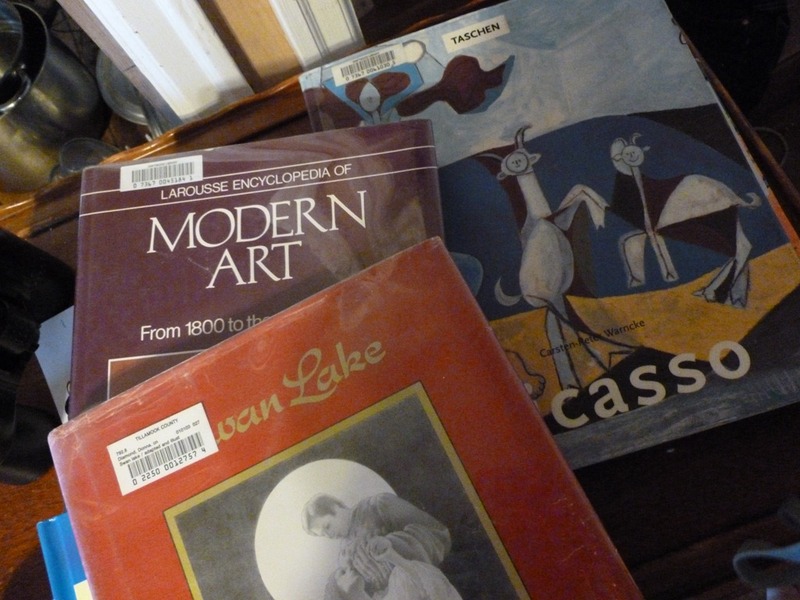 We looked through Swan Lake Music by Tchaikovsky – without Pandora and YouTube we were not able to listen to the music, but had really great discussion. 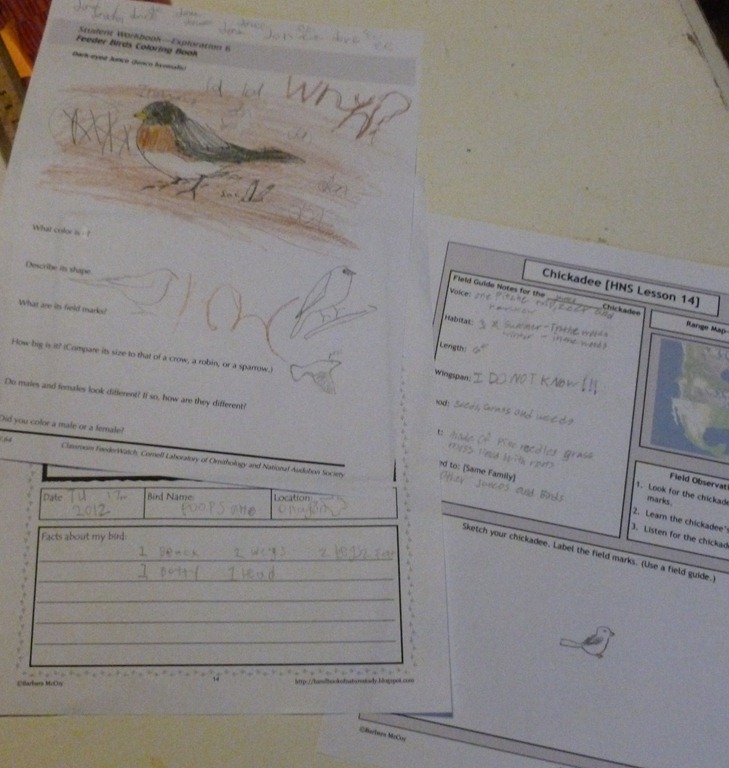 This Photo is mostly for Barb – The boys really enjoyed the birding Notebook pages. This was from a couple of days ago – a long day of notebooking on another subject. You can’t really see it – but Jon, under the colored Junco – under description says – 1 beak, 2 legs, 2 wings, 1 tail. He had the Bird Name/Date/Location filled out. I read it and chuckled – So – what you’re saying is that you’re all done with notebooking today? He says ya, my thinker is done. Ha. I am also noticing that Nate’s Field Guide Notebook page, is becoming more of his own narration, rather than straight copywork. Thought you might like to hear the progression – and for those of you starting notebooking – see how it ebbs and flows. Link up with us! 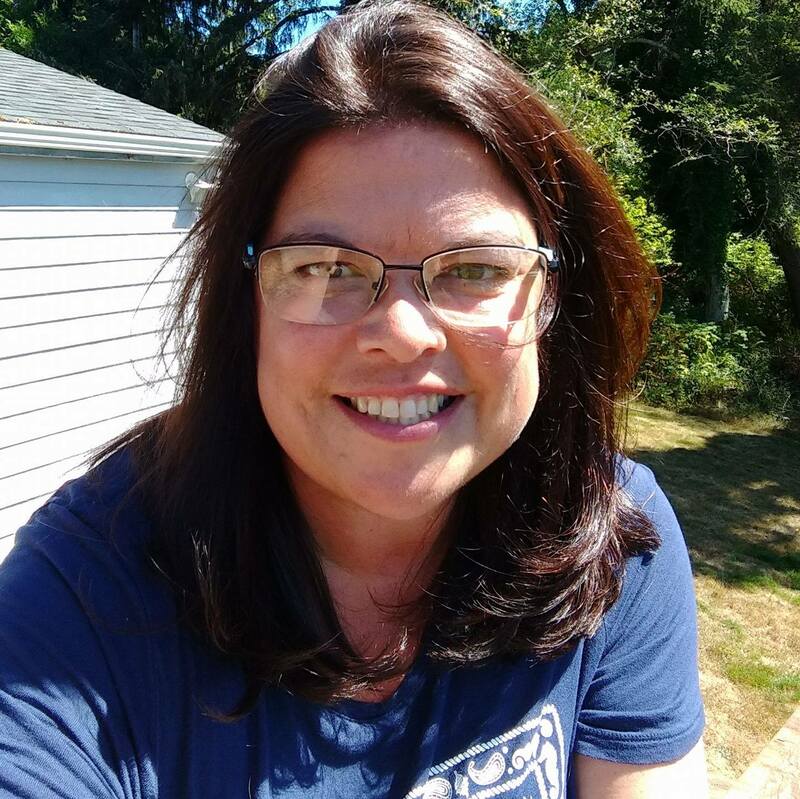 Join in at A Teaching Heart! 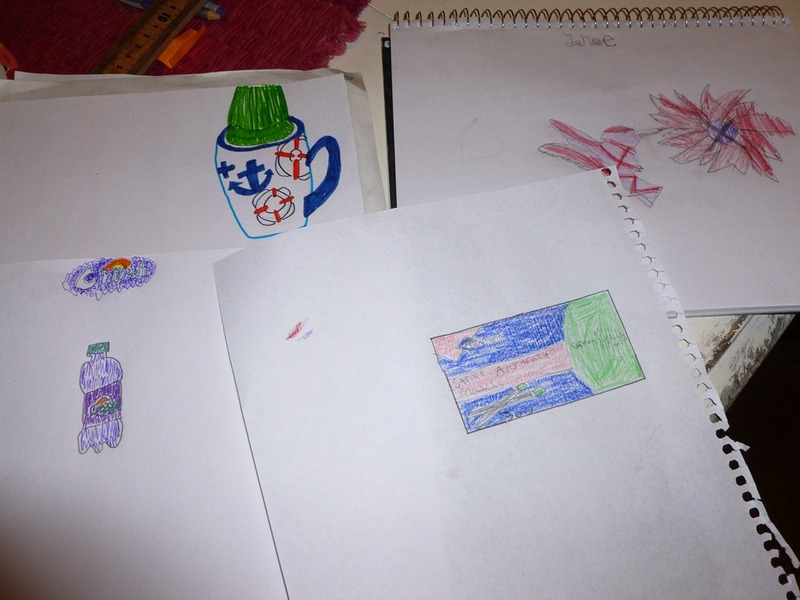 This entry was posted in Some Schooling and tagged Art, Artist, Boys, composer, HomeSchool, Middle School, Music. Bookmark the permalink. 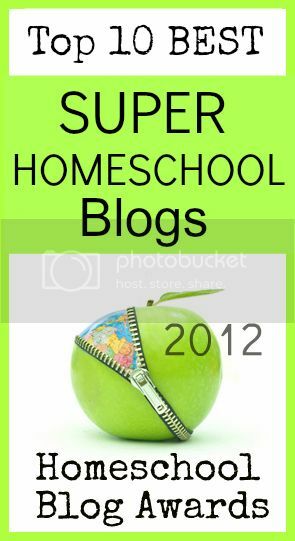 I love all those ideas for learning how complementary colors work! And I love the picture of all three boys working on the art lesson together too. So, I’m doing the AO rotation and am studying Biehl. I couldn’t tell which artist(s) you are doing. Please share? Thanks. Thanks so much. I, likewise, find her works to fit like a glove, but I’m not familiar with all of them. I’m closely following the current AO rotation (this term anyway) for everything, so my art is all Biehl, my music is Mendelssohn, etc. So I saw the pages you posted, couldn’t identify them, and it was driving me nuts. So, yeah, thanks so much. Again, love your blog. You’re week was way stronger than mine in art this week. I did more artist study, but not with hands on stuff this week. The notebooking this week was more about writing, and not about art, which I’m sure the kids found dry. So I’m so thankful for your post to give me a prod so I can rethink and adjust my direction, get them doing art, and make it more fun for them. Thanks! I totally understand. In years past – we did more of the – Look. Monet. Now, Recipricals. . . . . Now that both boys are through with learning Fractions it frees up about an hour of our day, their math is so much easer! We’ll be starting Chemistry in the next couple of weeks – so we’ll see how that works into our time frame! Just got back from the link to the Artists and Composers. WOW! I’ve never found that before on her site! Thanks so much! Not prepared to buy it right now (just bought two winter studies), but I know I will down the road. Again, thanks. She has free sets too! Mini units.